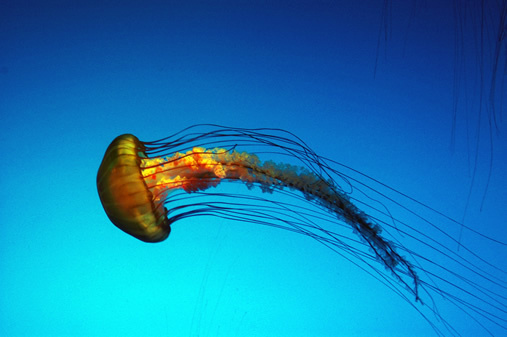 It is truly amazing to think that jellyfish have been roaming our oceans between 500 and 700 million years, a time known as the Cambrian period. This makes them three times as old as the first dinosaur, yet they are still roaming the earth today! In 2007, a group of scientists discovered some beautifully preserved fossils buried in the rocks in Utah, America from 505 million years ago. This was an unusual discovery because soft bodied creatures like jellyfish rarely survive in the fossil record. Although thought of as primitive, they are far from this. They are the earliest known animals to have a nervous system and organised tissues and can swim using muscles. They are made up of a staggering 95% water, they don’t have brains but have a network of neurons that detect changes in water chemistry, to locate food and touch by another animal. There is also a species that has been deemed “immortal” by scientists. The Turritopsis nutricula jellyfish, discovered in the Mediterranean Sea has the remarkable ability when in maturity, to regenerate its cells, which it does in times of crisis (injury, starvation.) It does this by attaching itself to a surface in the warm ocean waters and converts itself into a blob. From here transdifferentiation occurs, when cells transform into different cells, e.g. muscle cells into nerve cells or sperm or eggs, then the cycle of regeneration starts again. Jellyfish truly are fascinating creatures, how amazing would it be to have a living, breathing state of the art jellyfish aquarium in your classroom. To watch these creatures grow and develop, to watch them feeding on brine shrimp and seeing them change colour as they do so.